It all started on a small farm in Northeast Iowa! It's here that Norm learned the value of hard work and education and the importance of family and friends. Grandfather Nels and Grandmother Emma with children Oscar, Henry & Ned. Norm was the oldest of three siblings: Palma, Charlotte (seated) and Norm. Norm, age 8, and cousin Vilmar (Sina's brother) dressed in work wear. Norm's cousin, Sina, was instrumental in helping Norm get to high school. Norm wrestled for Cresco High School. He also wrestled at the U of Minnesota. Norm played on the Saude team. He dreamed of playing for the Chicago Cubs. Norm at the University of Minnesota. He received a bachelors in forestry. Palma (sister), Clara (mother), Norm, Henry (father) and Charlotte (sister). During his early school years, his grandfather Nels was probably the most influential person when in came to being earnest about learning. His cousin and teacher, Sina, also encouraged him to pursue more education than was common for the time. 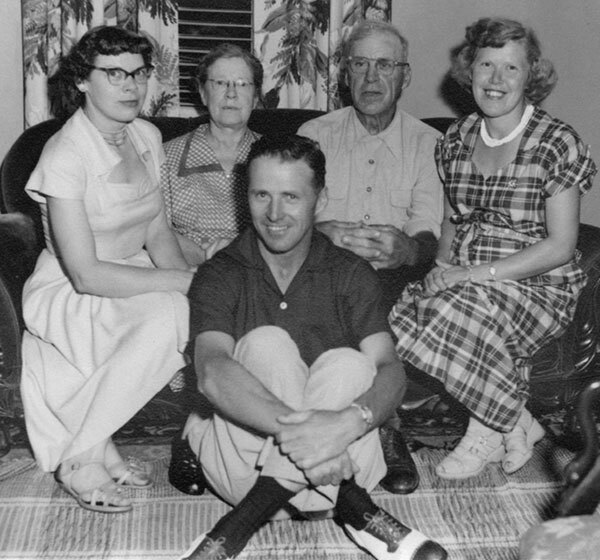 Both of these individuals told his parents and Norman that he should continue his education by attending high school in Cresco, twelve miles to the north of the Borlaug farm. Norm's sister, Palma, spoke about her brother's passion for learning. "Norman was always asking questions; he had a curious mind. Growing things fascinated him from his childhood. He always had a feeling for plants, a pasionate desire to know how they grew. He was curious about the change of seasons and the migrations of wild ducks and geese. He would ask, 'Why do the other birds - robins, blackbirds, bobolinks - not migrate in flocks, like ducks and geese? And why do the weasel and jackrabbit change their brown coats to white?'" Because of the distance, Norm had to stay in Cresco part of the time. That meant he wasn't able to help on the farm nearly as much. It was definitely a sacrifice for his family to allow him to attend high school. As with all things, Norm worked hard at his studies. Many of his courses were related to agriculture. Most students of this time period focussed on areas that they hoped to make their life's work. Norm was also an excellent athlete, and he soon caught the attention of the high school principal and wrestling coach, Dave Bartelma. Coach Bartelma was probably the most influential person in Norm's life during this period of time. Bartelma told Norm, "Give the best that God gave you. If you won't do that, don't bother to compete." Norm not only lived up to the challenge during his high school career, he lived it his entire life. A statue of Norm was dedicated on March 25, 2014, in the U. S. Capitol Rotunda. It was the 100th Anniversary of his birth.